As per the title, clicking on Account Settings, both while deployed and on the landing page, results in a blank HTML page. I am using Firefox File Version 25.0.0.5046 (Product Version 25.0) on Windows 7 SP 1. I've already attempted clearing my temporary internet files, which makes me wonder if it isn't a FF settings error. Inspected the page with FireFox (had forgotten about that feature when I originally posted the thread) and found the culprit. Frizz has been notified about what needs changing. Update: In response to more information, here's my attempts to recreate this bug. 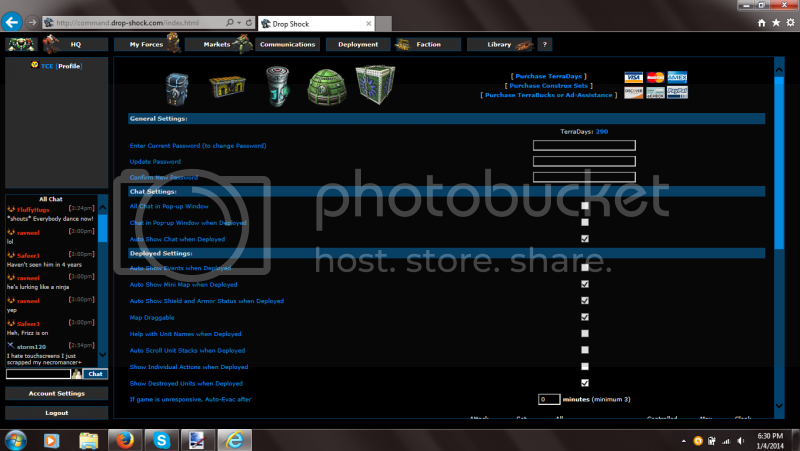 At this point, command.drop-shock.com/account.php should not appear; in its place is only a black background. 4. Right-click where account.php should be. Select "Inspect Element (Q)" from the menu. 5. If it isn't already selected, click on the "DOM and Style Inspector" tab from the new overlay. (See Screenshot 2). 6. Find #document; below it should be an expandable called <html>. Expand <html>. 7. Find <body id="body1DIV"...>; within that HTML string should be a setting called "style='visibility:hidden;'". 8. 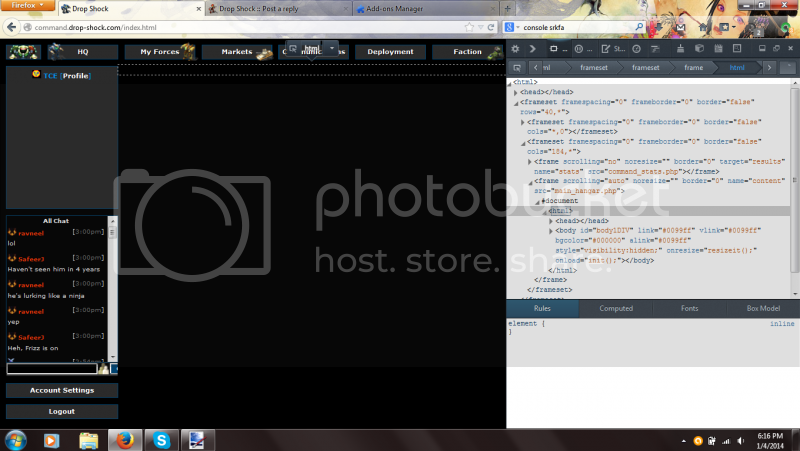 Activate "style='visibility:hidden;'" and change it to "style='visibility:visible;'". 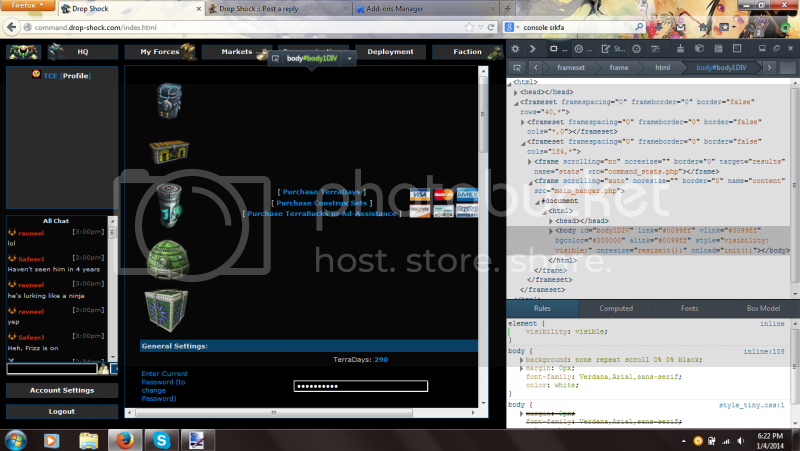 account.php should now be displayed properly. NOTE: This setting resets if you navigate away from account.php; you must recreate these changes every time you want to access this page. This issue seems to only exist for FireFox 26.0--it works as expected on Internet Explorer 11.0.9600.16476. I cannot currently test on Chrome, Opera, Safari, etc..
Can you try starting Firefox in "Safe Mode" (no plugins) and see if that has any effect? 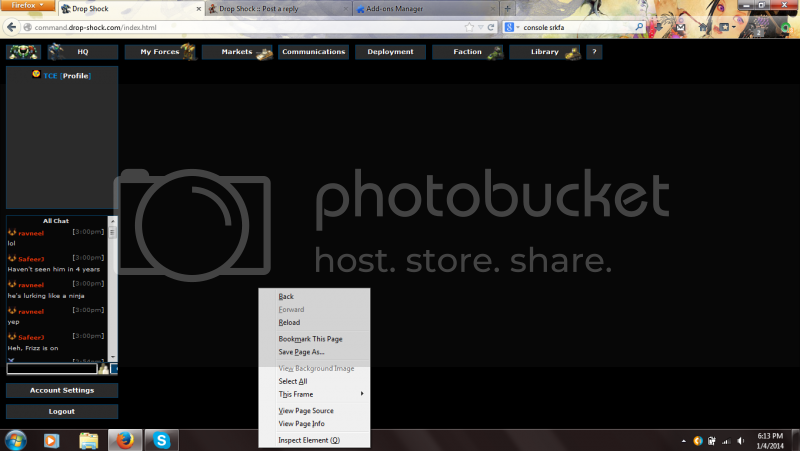 All plug-ins set to Never Enable, but account.php still isn't showing up for me. EDIT: He shoots and misses. Looks like Zoom isn't the root of this problem either.